Football progressed in leaps and bounds with the construction of the town oval in 1973 and the atmosphere generated there for 17 years was hard to beat. Who could forget the sheer volume of Saints supporters along the Western wing and the vocal Meaties behind the goals at the Checkpoint end. And it was indeed a brave umpire who made controversial decisions against Beagle Bay at the basketball end, while Bardi occupied the area in front of 'Sun Pictures' and Towns dominated the Eastern wing often with bold banners on the fence and a large tent to give players relief from the sun. The town oval with an overall length of 160 metres and 130 metres in width provided an excellent spectator venue, 'Red' made comment in 1980 about the oval and foresaw needed change for the future. a) What about another oval? b) Wherefore art the change rooms/showers/recreation facilities? As for the first question, apparently the Shire has another oval planned. A building with change rooms, kiosk, viewing facilities and perhaps even a Sportsmen's club would serve a multitude of people. This is not altogether unreasonable if sporting associations band together. 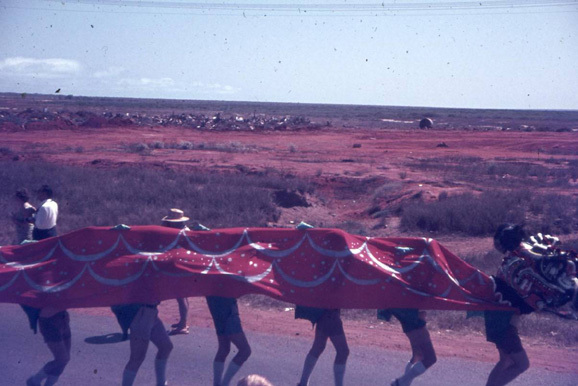 But then Broome might lose a bit of its local flavour. I mean, who can forget Towns changing on the NSW Bank verandah, Saints disrobing at Rabbits and Beagle Bay letting it all hang out on the back of the truck? A final word on the oval. Sid, the Shire gardener, deserves a knighthood for his work on the oval and adjacent areas. Arise, Sir Sid." While the condition of the oval was quite good in 1980, this was not so by 1985 due to overuse and water problems which continued on until footy was relocated to Frederick Street. "The Broome oval is in a terrible state. Ask any footballer about it and you get a ten minute diatribe containing repeated usage of that familiar six letter word. Apparently lack of watering is the problem with a faulty pump providing the stumbling block. The surface is deteriorating quickly, many patches devoid of grass." Other hazards included broken glass and sometimes the remnants of wire sparklers which needed to be removed from the oval prior to the game. Night football was experimented with in 1986 and proved popular although there was a slight problem with the spread of the lights. 1988 also proved difficult due to the oval being top dressed mid way through the season and a trench was excavated for deep water sewerage pipes just prior to the finals. Arguably the best side seen on that oval was the Derby Hawks Premiership team of 1984, who lost only one game to Roos by nine points during the season. 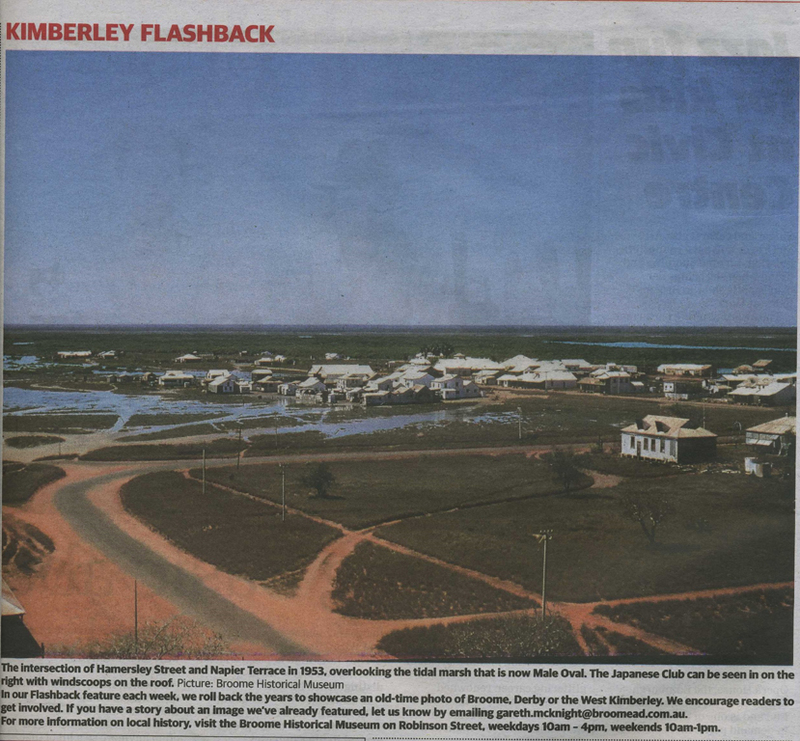 The move to Frederick Street in 1990 meant that Broome now boasted two public day/night ovals and an admission of $2 could be charged which became essential to meet the substantial increase in fees to be paid to the Shire. The oval measures 167 metres by 140 metres making it the ideal playing area for football. Incidentally, the WACA is 186 x 155 while the MCG is 180 x 140. There was no football played for a few years in the 1960’s until Father Mac revived the competition in 1969 which has continued uninterrupted to this present day. Father Mac was President of the footy Association for 6 years and he umpired for much longer. He coached the Towns Falcons footy Club to Premierships which stretched to five in a row during the 1970’s. Father Mac was responsible for relocating footy from the old Civic Centre Oval to the present day Male Oval which was formerly a rubbish dump and tidal flats. 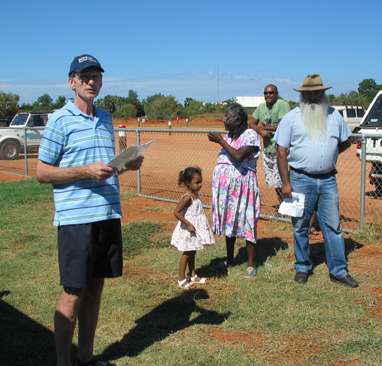 Father Mac has been aptly referred to as the father of Broome football and he was the first life member of this footy League. 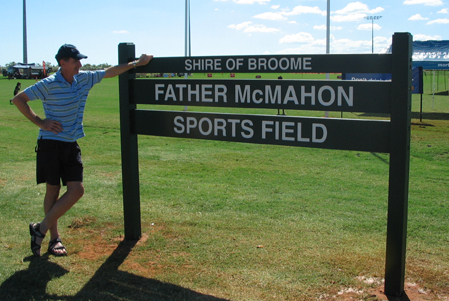 Sadly, Father Mac passed away last year but he would have been deeply touched to know that Broome has remembered him in a special way by naming a sports oval in his memory. 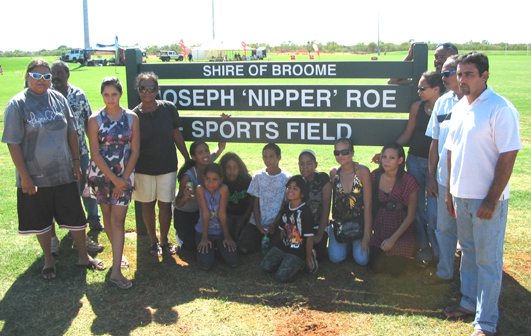 Joe “Nipper” Roe and Father Mac were great mates for over 25 years and it is very appropriate that these new sports ovals named after them are located side by side. Joe “Nipper”Roe played for East Fremantle Colts and in the winning Premiership with the 2nds in 1962. He played in Broome from 1972 - 78 usually in the centre and was the best exponent of the drop kick, being able to deliver the ball perfectly with either foot. Joe suffered two broken ribs while going for a mark in the first quarter of the 1972 Grand Final. He was the 'Best and Fairest' in that year and coached the Saints for two seasons in the mid eighties.